I remember loving two things as a 13-year-old: my lilac stretchy halter dress and Mila cake. The dress I thought “showed off my curves” (the non-existent ones), and I wore it to every dance at my school that year, not to mention trips to the grocery store, youth symphony rehearsals, and birthday parties. 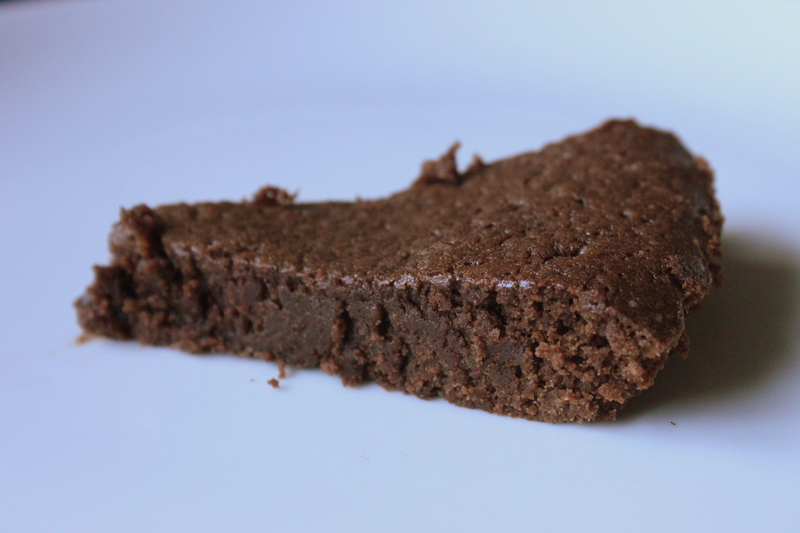 It was at one such birthday that I first encountered Mila cake, a hybrid brownie-cake creation of a friend’s Swedish mother that was crumby on the outside and irresistibly gooey in the middle. I was going through a bit of a “health phase” at the time, baking tasteless brick-like lemon loaves that oozed olive oil and dreaming of opening a soy-products store called “Edamame.” The Mila cake was the first glimmer of my return to butter, sugar and cocoa, a herald of the joyfulness eating could be. I tasted it a handful of times after that, and then it was gone—disappeared into the vault of childhood memory along with Zoo biscuits, Nicole’s mom’s shepherd’s pie, and the curious sweetness of the chocolates that came in my Christmas Advent calendar. For years I imagined what it would be like to make it, and no brownie or chocolate cake quite lived up to that legendary first bite. 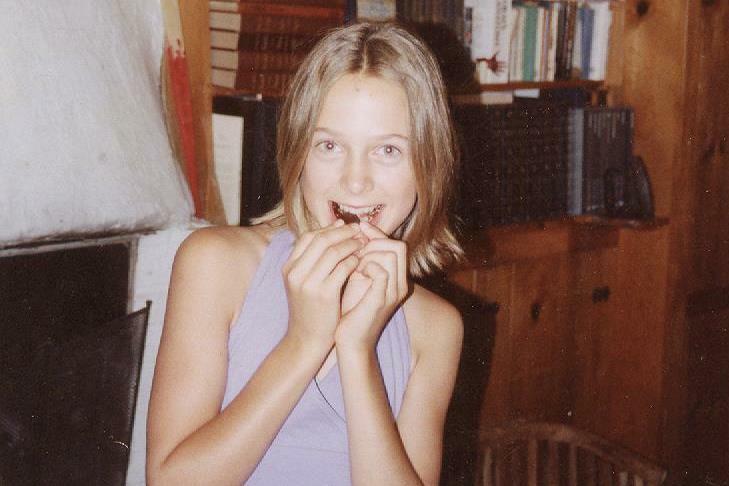 A photo of me in my dress eating Mila cake became a sort of talisman, a perfect moment when all my younger, simpler desires were fulfilled. It only occurred to me this week, almost ten years later, that the cake might be a Swedish specialty, and a quick google search revealed my hunch to be on the right track—the photos of “kladdkaka,” a traditional Swedish chocolate cake, looked almost exactly like the cake that had eluded me for so long. We all know no memory can ever be truly fulfilled—no tube of Nestlé Smarties tastes quite like the one you were given by your grandparents when they came to visit, and that crush you had in fourth grade definitely looked cuter with braces. But having made what I still consider “Mila cake” three times now, I feel I’m getting close (partly because no cake lasted more than three hours on the kitchen table). And along with the old memories, I now have a collection of new ones: my last winter nights in the cottage, with Christine playing music, Phillip and Ross playing zombies, Sara eating a bagel on the couch, Adam in his red sweater and hat, and an empty pan of Mila cake crumbs on the living room table. Adapted from the recipe for Swedish Kladdkaka on It’s Time to Bake. Preheat the oven to 350 degrees. Beat the eggs with the sugar until mixed, then add in the flour, cocoa powder and salt one at a time. Whisk the vanilla extract with the melted butter, then combine with the egg mixture and pour batter into a greased 8-inch pie plate. Bake for 15 to 20 minutes, or until the edges are set and the middle is still soft and gooey. scrumptious looking! I want to rip it off the screen and eat it, my mouth is watering. I must try this recipe! Made this today and I have to say it was the perfect afternoon treat. Just the right amount so that I’m not feeling guilty. Excellent! Thanks for the recipe. So glad you enjoyed it as much as I do!